With a nor'easter on its way, we decided to stay in tonight and make some comfort food. I had recently made my two favorite soups - corn chowder and roasted potato-onion-garlic soup - so I wanted to try something new. 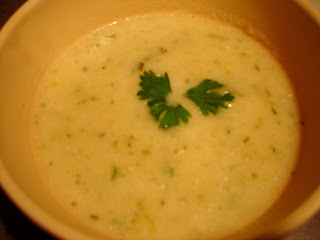 I came across this recipe for Cauliflower Soup. I made a few small changes, noted below. In a large pot, heat up the olive oil and 2 tablespoons of the butter, over medium heat. Season with salt and pepper. Add the cauliflower florets and stir with a wooden spoon. Add celery, onion and thyme and cook for 3 minutes. Push the vegetables to 1 side of the pot. Melt 1 more tablespoon of butter on empty side of pot and add flour to the butter. Cook for 1 minute, stirring the flour in the butter. Mix in chicken broth and half-and-half. Bring up to a simmer and cook for 15 minutes. Puree soup using an emersion blender, food processor or blender and return to pot. We both liked this soup, but agreed that we could make some changes next time. I think I'd add garlic, maybe a clove or two. I'd also use less thyme. The flavor of the thyme was a bit over-powering. 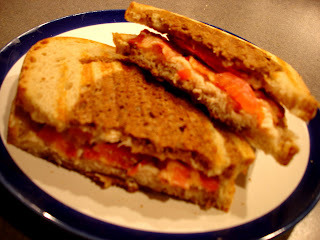 We used our panini maker to make turkey-bacon paninis. 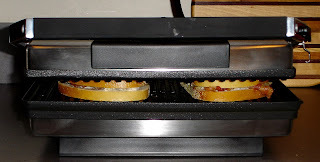 Using the panini press was easy, but the sandwiches were SO flat. Jon said he would have just preferred a cold sandwich. 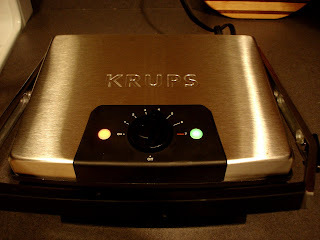 I liked mine but think next time I'll use a different bread. I would also like to try spreading some of my homemade spinach-artichoke dip onto the bread with the turkey and bacon. I'll be making the dip for Christmas Eve so I'll post the recipe then.